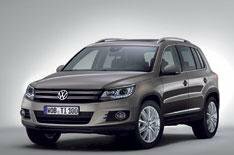 New-look VW Tiguan revealed | What Car? This is the revised Volkswagen Tiguan, which will make its debut at the Geneva motor show in March. The face-lifted model now incorporates VW's latest design, bringing it in line with the companys latest cars. Details of changes have yet to be announced, but its expected to get a range of new technology when it goes on sale. Order books in the UK are due to open in early summer, with deliveries scheduled to start in August.